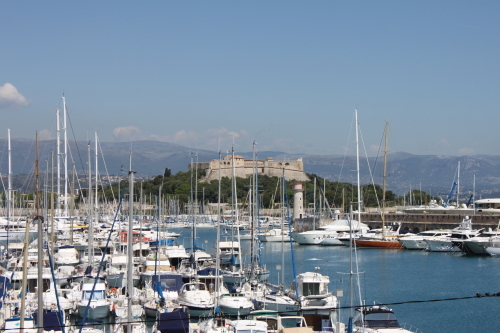 My friend C had kindly invited me to stay with her in Antibes which is just a short hop from Nice airport. 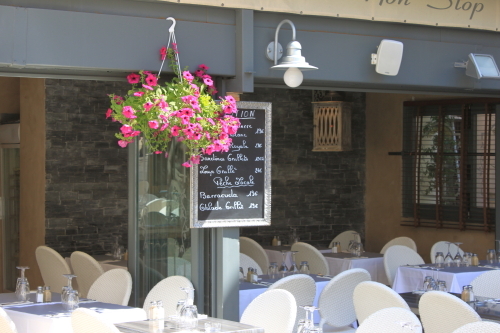 When I reached Antibes I caught up with her in a café on Place de Gaulle. 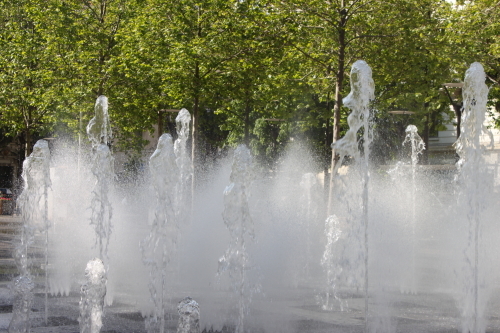 The square has cafés and shops on all sides and in the centre there are serried rows of constantly cascading fountains performing an ever-changing water ballet. Coffee and chat over we headed not quite for the hills but a little out-of-town to C’s apartment. C prepared a simple but delicious meal; roast chicken with roasted red peppers and tomatoes, a couple of French cheeses and yummy apricot tart. Naturally we had some local rosé wine with the main course and with the tart a glass of scrummy orange wine made by C’s neighbour. Next day I headed off to explore old Antibes. The forecasters spoke with forked tongue because instead of the predicted rain there was brilliant sunshine. I walked around the pretty narrow cobbled streets, took in the forest of masts on a mass of boats in the port, paddled in the warm sea that lapped the sand in a sheltered cove beside the old port and visited the Picasso Museum (more about the museum in another post). Then I met C for lunch in a quintessentially French café. In the afternoon we headed to the beautiful Cap d’Antibes. We had a late afternoon glass of wine in the Eden Roc restaurant of the Hotel du Cap. 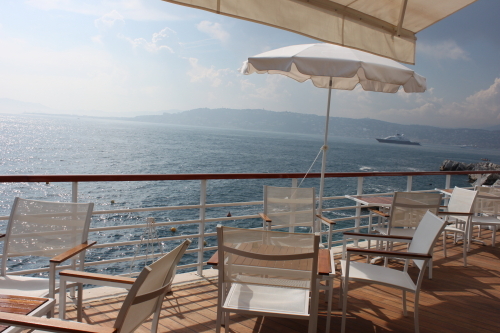 The terrace in the restaurant looks like an ocean-going liner – the setting is spectacular. On Wednesday we went to Nice to meet with some very lovely friends of C’s for lunch. There was also time to have a look around the flower market and the shops. Amazingly I managed to wander around the Agnes B concession in the Galeries Lafayette without buying a single thing. My short holiday was too soon over and yesterday I caught an afternoon flight back to an overcast Dublin. Note; Orange wine a speciality of the South of France is made with rosé wine, Seville oranges, sugar and brandy. I am going to make it when Seville oranges are next in season and will post a recipe. I cannot wait to taste your orange wine – book me in for a private tasting. Welcome back to the overcast skies and drizzle, your home,. C.